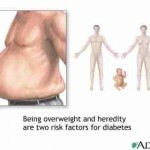 Here is a great video on the basics of what diabetes is. And here is one on Type 2 Diabetes. Explanations of how diabetes develops and progresses often involves two things: genes and environment. 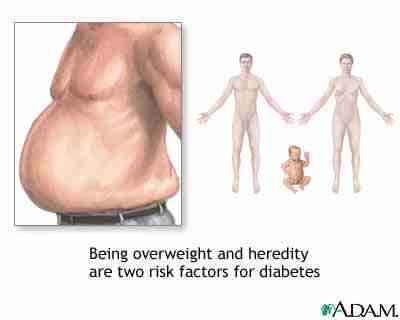 In other words, you may be born with a genetic disposition to diabetes that is then triggered by an environmental event or behavior. As it turns out, though, these factors aren’t always so separate. Scientists are finding that the environment can affect and even permanently modify genes themselves. How and why this happens is the subject of an emerging field of research called epigenetics. And the evidence suggests that diabetes may both cause epigenetic changes and be caused by them. It’s a classic of what came first, the chicken or the egg. The prefix epi- means “on top of” or “in addition to”; epigenetics is the modification of the surface and message of a gene without altering the underlying DNA sequence. It’s something like making a proofreading mark on a document. For people with diabetes, high or low blood glucose may trigger epigenetic changes. Some research suggests that these changes to genes may spur the development of diabetic complications, such as kidney damage and heart disease. Even a brief exposure to high blood glucose may cause an epigenetic change that stays in your body. This is called hyperglycemic memory, and it may explain why some people with diabetes get complications in spite of having good blood glucose control on average. The development of both type 1 and type 2 diabetes is known to be influenced by the environment. Researchers are looking into what types of environmental factors, from nutrients and toxins to behavior and lifestyle, can trigger these epigenetic changes that raise or lower diabetes risk. Scientists suspect that a mother’s nutrition while pregnant or a child’s diet during early life may even cause epigenetic changes that persist into adulthood. For the diabetes population, this is important because the pancreas’s insulin-producing beta cells replicate very early in life and then stop. “So a cell with epigenetic changes [from early life] just stays there.” And if epigenetic changes are transferred between cells through replication, then these changes in early life may have an even greater effect since they will be passed from the mother cell to the daughter cell throughout growth. Epigenetics is a young field and a challenging one. Just identifying epigenetic changes to genes is difficult, a bit like trying to find a single out-of-place word in a long novel. Even so, researchers may someday discover through the study of epigenetics that the key to diabetes resides at the intersection of where genes and the environment meet. People with diabetes looking for a one-size-fits-all “right” way to eat are going to come up short. There probably is no one way to eat that works for everyone. For some, all but nixing carbs is the ideal way to normalize blood glucose levels. For others, eating a higher-carb diet and covering the carbs with insulin or oral medications wins. This is all part of the reason that the American Diabetes Association stresses that meal plans should be geared to fit each person’s individual lifestyle. So what should you do if you have diabetes and you’re trying to eat healthfully? First of all, keep in mind that what works for someone else may not necessarily work for you—and vice versa. You may need to experiment a bit to see how different methods affect your blood glucose levels. Consider making an appointment with a registered dietitian, who can review your individual needs and circumstances and help you tailor a nutrition plan that’s right for you. In the end, the best diet is the healthy one you’re able to follow. As someone with type 2 diabetes, you know far too well the toll diabetes takes on your day-to-day life. Therefore, today is your chance to help loved ones avoid going through something similar by learning their risk for type 2 diabetes. Today is the 23rd annual American Diabetes Association Alert Day. Encourage your friends and family to take the Diabetes Risk Test to find out if they are at risk for type 2 diabetes. Share the Diabetes Risk Test with your friends and family by going to the site at the bottom of this post. Just by taking the test, they will become a part of the Join the Million Challenge, an effort to have 1 million people join the Stop Diabetes® movement. One in four people with diabetes is unaware that he or she has the disease. Please help us spread the word about the Join the Million Challenge. Chances are someone you love is at risk. Together we can Stop Diabetes once and for all. How Dangerous Is That “Beer Belly”? No one wants to be fat, but does it matter where the fat is located? Apparently it does. Researchers have found visceral or intra-abdominal fat is more dangerous than other fats. This “beer belly” fat is connected to many health problems, including heart disease, stroke, and some types of cancer. Scientists aren’t quite sure why this type of fat is so dangerous. The theory is that all fat cells secrete hazardous chemicals, and those deep in the abdomen release three times as many of these chemicals as those under the skin. Also, the chemicals made by visceral fat cells are dumped directly into the liver, causing disruption in normal liver operations.